The Cork Boat Lotto will commence with the first draw taking place on Sunday 25 November 2018 at 11 AM in the cafe. Any corrections will be made during the week when the categories are added. 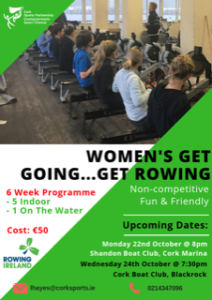 Women’s “Get Going Get Rowing” programme will commence in the club on Wednesday 24th Oct at 19:30.